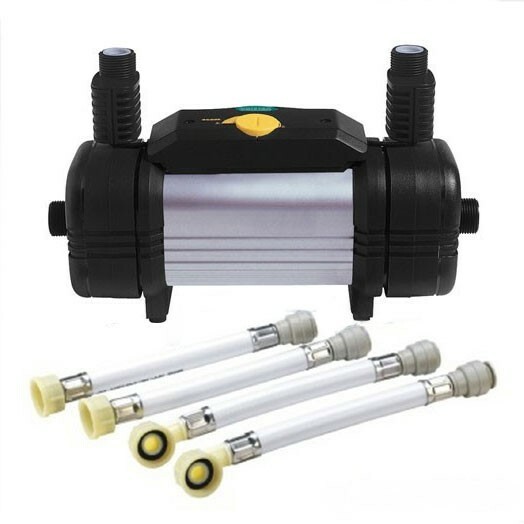 This pump is a direct replacement for the Showerforce Easiboost shower pump. The New Team Duraspeed pump is a twin impeller pump that is designed to boost both the hot and cold water supplies to your shower. The New Team Duraspeed pump is a twin impeller pump that is designed to boost both the hot and cold water supplies to your shower. IMPORTANT NOTE The Duraspeed pump has been changed. The body of this shower pump is now the same as the Varispeed Model, it is Black and we are including the correct Anti Vibration Couplers so this pump can be used as a direct replacement for the original PURPLE coloured Duraspeed pump (hence, the price difference between the 2 models). The Newteam and Showerforce Brand names are owned by Bristan, as part of their ongoing streamlining of operations all brands are being amalgamated under the Bristan banner. It is very likely that your new product will be boxed and badged as Bristan not Newteam or Showerforce. New one is not fitted yet,but the existing pump served us very well! Easily fitted , as per instructions , direct replacement for "New Team" one which was leaking. Worked immediately. Worked as expected, direct replacement for broken pump. Good pump for the price, it does what it is suppose to do. Was actually send a Bristan Varispeed shower pump after ordering a Duraspeed. Was told it was an equivalent even though the original Duraspeed was continously rated and the Varispeed is only rated 15min on 60min off. In my experience there is a difference, the Duraspeed lasted 6 years and the 2... Read More. Was actually send a Bristan Varispeed shower pump after ordering a Duraspeed. Was told it was an equivalent even though the original Duraspeed was continously rated and the Varispeed is only rated 15min on 60min off. In my experience there is a difference, the Duraspeed lasted 6 years and the 2 previous Varispeeds only lasted 3 years each. The pumps aren't the best but are cheap and fitting takes moments. Is up and running . . . very efficiently. Hopefully, this will continue! Excellent product. Good replacement for our existing pump,which had failed, and much cheaper than we could have obtained through a local plumber. I was sent vari 50 which was out of stock on enquiry..it was what I already had and works fine. Not as powerful as the exact one I took out. so a negative there.